I want to tell you a story about a dog. a lonely dog. an abandoned dog. an underdog. It’s a story about love and second chances. A story about a hero. In fact, its truly a story about more than one. At the tail end of this past summer, just as the last stray drops of warm golden sunlight were fading away for the year – I opened up my inbox and found the most wonderful thing. In it, was an invitation to the Indian River Inlet United States Coast Guard base in Delaware asking me to chronicle the life of Mr. Beefy – a 6 year old Shelter Pit Bull mix with an incredible story. Needless to say – I graciously accepted the invitation – and scheduled the 7 hour road trip down to the Delaware Coast as soon as I possibly could. It would be an understatement to say that spending the day with the Officers of the Indian River Inlet USCG base was amazing – It was one of the most memorable experiences of my life. And one that I wont soon forget. So, without further ado – I am proud to share with you a remarkable story about a remarkable dog. Mr. Beefy spent the first part of his life in loneliness and confusion, without any semblance of love or stability. For the most part, the first years of Mr. Beefy’s life are unknown. Although if he could talk, I imagine the tale would be heartbreaking. Mr. Beefy was found one very hot summer afternoon chained to a tree behind an abandoned house. No food, no water, no relief from the sweltering heat. Just tied to a tree, left for dead. This is where the story starts to take a turn. The amazing team of passionate, dedicated animal rescuers at the SPCA of Delaware’s Georgetown Shelter received an anonymous call, alerting them to this scared, abandoned dog’s situation, and they immediately stepped in to save his life. Moving slowly and deliberately, the SPCA team unchained a frightened and devastated Mr. Beefy from the horrible backyard prison where he was stuck, and proceeded to take him to their facility – where they could check his health, give him a warm bed and a belly full of food, and start the long journey of finding Mr. Beefy his perfect, forever family. Well, here’s where it really starts to get good. And where is that home, you ask? Mr. Beefy has found his perfect place in forever at the Indian River USCG Station in gorgeous Rehoboth Beach, DE. Mr. Beefy is now a ranked military officer with his official title being ‘Seamen Apprentice’ for the United States Coast Guard. He serves on an indefinite enlistment and tour length. Seaman Apprentice Beefy serves as unit morale booster and is authorized to conduct public outreach to promote U.S. Coast Guard recruiting and missions. Mr. Beefy can be advanced for exemplary performance and behavior. He lives, full time at the beautiful Indian River Inlet Coast Guard Station, keeping watch with a wag and a smile over the stretch of waterfront land that he calls home. As he is a documented Military Mascot, Mr. Beefy is afforded the same rights, privileges , support services and health surveillance as other as other government owned working animals. Beefy receives all of his medical treatment via Dover Air Force Base. Mr. Beefy was adopted into the ranks of an amazing team. He is very proud to hold his spot in the lineup. Mr. Beefy has snuggled so gratefully in to his remarkable new home. The loneliness of yesterday has faded into tiny reflections in Mr. Beefy’s eyes. He’ll never forget where he started — as a frightened, abandoned dog, thrown out with the garbage and left for dead. Without his past, he could never appreciate where he is today – a ranked United States Coast Guard Officer surrounded by all of the love in the world. When Mr. Beefy used to fall asleep on the cold hard floor in his cage at the shelter, he would dream up brilliant dreams of his forever home and a new family to call his own. But never did he ever imagine how incredible that dream would actually turn out to be. Mr. Beefy learned the most remarkable thing — that sometimes, reality is better than even the wildest imagination. Mr. Beefy now has more than just a place to call home. After waiting 1 year and 3 months, Mr. Beefy has more than just a family. Mr. Beefy, the canine officer of the Indian River US Coast Guard Base, now has 32 family members to watch over him. 32 sets of arms to keep him warm. And 32 hearts to love him completely. For Mr. Beefy, this is heaven. I had such an incredible time capturing the tiny details that are all a part of ‘Seamen Apprentice’ Beefy’s daily life at his new home on the base with his fellow officers. From a lonely, scared shelter dog to a proud, ranked military officer for the United States Coast Guard. So, the next time you think that all shelters dogs are ‘broken’, and that they cant be taught how to love again – think of Mr. Beefy. Think of the brave men and women that have devoted their lives to protecting this great country, and how they opened their hearts to an underdog. They saw a sparkle in the eyes of an abandoned shelter pit bull when nobody else did. And when you give love a chance, the most incredible things can happen. Would you just look at the miracle that love can perform? …. And those heroes that I spoke of? Well here’s one. This is Joanne Bradley Murphy, the volunteer coordinator for the SPCA’s Georgetown Shelter. She and her team of rescuers dedicated endless time and energy to keeping watch over Mr. Beefy while he was in the shelter’s care. Their team kept him close and safe during the hardest parts, standing right beside him every step of the way through his incredible journey. Joanne helped to see him through to the very end. She came along on the day of our shoot to check in with her sweet boy, and to see how life on the waterfront has been treating him. Seeing these two together brought me so much joy – their intense connection and love was tangible. And would you just look at that smile on Mr. Beefy? Its safe to say that he’ll never forget the love that Joanne so selflessly poured out to him when he needed it most. And speaking of heroes – after spending an afternoon with the USCG Officers – I cant continue without mentioning the men and women who have chosen to devote their lives to protecting this great country. I cant begin to express my gratitude for their service. Because of them, I have the freedom to live my dreams.Their sacrifice is a precious gift to all Americans. To the Officers of the USCG Indian River Inlet Base – Thank You. Not only did you step up and selflessly save the life of an abandoned shelter dog, but you live every day in the spirit of protecting my freedom in a country that I am proud to call home. As far as heroes go – here are two more. This whole excursion wouldn’t have even been possible without these next two people. Tom and Renè – unwavering animal rescue advocates and bully breed supporters – are two of the most selfless, and endlessly giving people that I have ever had the privilege to meet. Their kindnesses are unprecedented and I am proud to fight feverishly alongside them to help save homeless animals in need. They are solely responsible for connecting me with the SPCA of Delaware and for arranging my travel and photo shoot with Mr. Beefy and the Coast Guard Officers. Their passion is what made this whole adventure happen. I think Mr. Beefy was quite grateful to meet them. Mr. Beefy had me cracking up for the better part of our session together. His kryptonite? Peanut Butter!! While this post is about celebrating Mr. Beefy and his journey, there is also a much bigger picture that he stands for. Everyday, over 2,800 Pit Bulls die in shelters. That’s over 1 million Pit Bulls every year. Dogs just like Mr. Beefy – who were born to a world that let them down – a world in which, even just existing is a crime. Each and every dog with their own individual stories and personalities. Each with red beating hearts inside their chests and warm glowing lights of hope behind their eyes. Each with one simple wish, one common dream: to be understood, and to know love. They watch the world through the bars of their cages, hoping for families who never come. And after dreaming endless dreams of love, their lives are taken from them by a cold needle before they ever have a chance to fly. Here’s to hoping that Mr. Beefy can be a reminder of all of these dogs – that he can stand up for their legacy. He is one of the rare ones – one of the ones who made it out. Let his story serve the memories of all of the ones who were left behind. Let the kindnesses of the men and women of the Indian River Coast Guard Station of this great country be a valuable lesson – you can find love in the most unexpected places if you’re just brave enough to look. Until there are none, rescue one. We love you Mr. Beefy! Previous postHappy Pit Bull Awareness Month! I am in tears! You captured our boy Beefy’s love and spirit in every photo. Beefy will always have a piece of our hearts. This is so beautiful! Thank you to the Georgetown SPCA for saving him and thank the United States Coast Guard for taking a a chance on Mr. Beefy! Happy Tails! What a breathtaking story. Tears are flowing down my cheeks. The incredible photos and the way in which you tell his story is mesmerizing. Thank you for sharing such an uplifting and happy tale. What a beautiful story! Will think of this wonderful story next time we are by Coast Guard Station. Thanks to all who saved Mr Beefy. Wow……..heartwarming and heartbreaking all at the same time! SO happy for Mr. Beefy…….SO sad for the many, many pitts and pitt mixes that are euthanized every day. I grew up with pitt-Rhodesian mixes and they were absolutely wonderful. I will forever be an advocate for these wonderful animals! The bad reputation they have comes from the people that mistreat them………. I have been waiting to see these pictures by Dogbreath Photography. So beautiful and incredibly well-written! Tissue alert!!!!! But this is happy tears. Beautiful pictures and a beautiful dog. Every dog should have this type of happy ending. And the pictures are so awesome. I can hardly see through my tears. Beautiful story; beautiful photos, beautiful you! Thanks to the SPCA and the Indian River Coast Guard for giving Mr. Beefy a second chance at a wonderful life, and to you, Kaylee, for your huge heart and poignant way with words! I don’t even have words for how incredible you are. Every post is better than the last, and all are so heartwarming (even the sad ones). You do wonderful, courageous things every day and I’m honored to have met you. Your life must be exhausting, but so rewarding. Thank you for bringing us your stories and for saving shelter animals by sharing them. wonderful story and spectacular photos! thanks for sharing his story! Lord bless all who have made Mr. Beefy’s life worth living…. thank you all for the love you’ve given this special boy. What a beautiful story – Mr. Beefy is a success story. Bless him and the people that saved him!!! I had the pleasure of meeting Mr. Beefy. He was so sweet and gave me kisses. He’s a rock star here is Southern Delaware and everyone who knows him loves him. His story is all too common these days, but a happy ending has over shadowed his past. Thank you for such amazing photos of this special dog. I especially love the one of you and him together. being in rescue for a very long time it’s easy to “lose our way” with all the drama involved with volunteers and all the sadness we see. Thank you for bringing me back down to earth and remembering WHY we rescue. Thank you for another “love” story. Your voice is loud and clear speaking for all the shelter dogs that need and want to be loved and to give their love and loyalty. Your photos are breath-taking. You can see the love in the dogs’ eyes. Thank you again for making the world a bit happier for some of these wonderful creatures. Ty for writing Mr Beefy’ story! I am a pit bull mom and the rescuer! I am inspired daily by this amazing breed. They forgive humanity for unthinkable and choose love. We have so much to learn from them; in fact, from all dogs in general. Prince is sending you his love-he is also, a 2nd chance rescue pittie-he was shot and beaten by gang members. He has his family, his 5 y old humane sister,and 2 pittie brothers-Buster and Chance!!! Have the greatest life, Mr.Beefy! Delightful story … now get up and fill your home with some furry, loyal love by visiting your local animal shelter. the dog you rescue will never, ever forget. So happy for Mr. Beefy. Hope he has a long and healthy life – with lots of love and hugs! Thank you very much for your story. I am owned by a hard working, hard loving Pit Bull named Iggy. We rescued each other. He’s my rock. He’s my sweety. He’s also my service dog. I have never had a deeper connection to another living being in my life. He has helped me through my disability, a divorce and leukemia. These dogs have such an incredible loyalty and capacity for love. Iggy and I thank you for such a wonderful story. Thanks also to the brave men and women of the Coast Guard for giving Mr. Beefy a chance and a home. Wow ! that really is a most heart warming story ! YOU GO MR. BEEFY ! That’s why rescue dogs without a doubt are the most loved and want-a-be loved animals on this planet ! I ❤ Mr. Beefy's story so happy I own 3 pit bulls and see their loyalty and brains, great dogs! Just a suggestion for Mr. Beefy's health put him on a raw diet @ least 1 meal a day and he will live longer and may have no knee problems. I had trouble with Candy my purebred pit bull with thyroid and weight now she is on the right amount of thyroxin and one raw meal a day and she is moving better with less weight to carry around. Now that's love to get him healthly. Sitting here sobbing happy tears. What an amazing and heartwarming story with the HAPPIEST of endings. Beefy was truly an amazing dog. There was not one person at the shelter-staff and volunteers alike-who didn’t love that guy. When the Coast Guard adopted Beefy, there were many, many tears of happiness shed. The only wish of every staff person and volunteer at the SPCA is that EVERY single dog and cat that passes through their doors, ends up with this kind of happily ever after. Thanks to the Delaware SPCA, especially the Georgetown shelter, for all they do for the homeless animals. One thing the writer failed to mention-Beefy used to get visits from the staff and volunteers of the SPCA at the Coast Guard station all the time. He is one dog who will not be forgotten at the shelter. I am crying too! I have a pitbull too and he is my best friend. Mr Beefy is an incredable dog and so are the people that helped to save him , and the people that live with him!! Our Boxer, Daisy, was adopted from Delaware SPCA after being rescued by their Georgetown team. Thanks to Joanne and all the staff and volunteers there for our Daisy and also for saving Mr. Beefy and all the other animals that you shelter. And there are no words to express the thanks that the men and women of the US Coast Guard deserve for all they do every day to protect us… and especially the members of Indian River Inlet Station for what they have done for Mr. Beefy. Best story ever by Kaylee of Dog Breath Photography! Thanks for telling it with such awesome photos and words! I could watch this over and over….I felt his sad and lonely existence..and his joy to be finally spared the needle………….and what a good group of men to love him …I thank all of you who made this happen !!! One dog at a time …we can save them ….Rescue is the way ! Such a heartwarming and touching story….thank you for sharing and many thanks to all who cared, loved, and never gave up on this loving soul. Spectacular story – beautifully captured and charmingly described. Thanks for all you do! I couldn’t stop crying as I read this story! I was fostering a beautiful pit bull and he past away. I miss him dearly. I wish more people would do the same. All they want is to be loved! Awesome !!!! We have a rescued pitbull, she is my favorite child ! (Love your hair by the way). What a wonderful story. Mr. Beefy is on handsome fella! Tears…wonderful…rescue, rescue, rescue! Bless you all!!! What a great story. Lovely. Reblogged this on miltoriousb1g's Blog. This was wonderful and beautifully written. Thank you, I will re-post to share with a friend. Sonia McCrory this reminds me of your “Who saved Who”! Thanks for such an inspiring true story! Wow, what a wonderful heartwarming story, and so beautifully written and photographed. The dog is so very luck. This picture is a very nice and so cute a dog. GAH! Wasn’t expecting to find this in the feed. Thanks for moving me to sniffles of joy. Thanks also for the shout-out to those who serve this nation and those who serve others selflessly – whether human or animal in need. Beautiful story, great photography! Thanks for sharing. You are way cool, Mr. Beefy! Thank you USCG for making him part of your family. Dogs just want to be part of a team doing something useful and their joy in that is infectious. A beautiful story – thank you for capturing it as you did! Amazing. Best wishes to Mr. Beefy nad his enlarged family! Um… I just joined wordpress today on a suggestion from a cousin and I don’t know whether you’d read my comment but personally I really liked reading your blog. I really like stories such as this one and it’s starting to seem like joining a blog may have been worthwhile after all. I hope to come across more stories like this. I’d like this blog more than once if I could. Aww! This is such a wonderful comment! Thank you so much for taking the time out of your day so write such warm words. I cant tell you how happy it makes me to hear that you enjoyed this blog post about Seamen Apprentice Beefy! 🙂 I hope you find your blogging experience to continue to be wonderful and rewarding. Thanks again for taking the time to stop by and check out the blog! Reblogged this on An assortment of misfits. I love pit bulls! Loved your story. Dogs are the most incredible beasts in the world. I wish I had a farm where I could have 10!! Wonderful story….I am happy he could find loving people who take care of him. This made me tear up, I’m so happy he found a forever home. A Heartwarming story of a dog. Amazing read. The fiance and I love you too, Mr. Beefy! To rescue dogs everywhere! Thanks for writing! 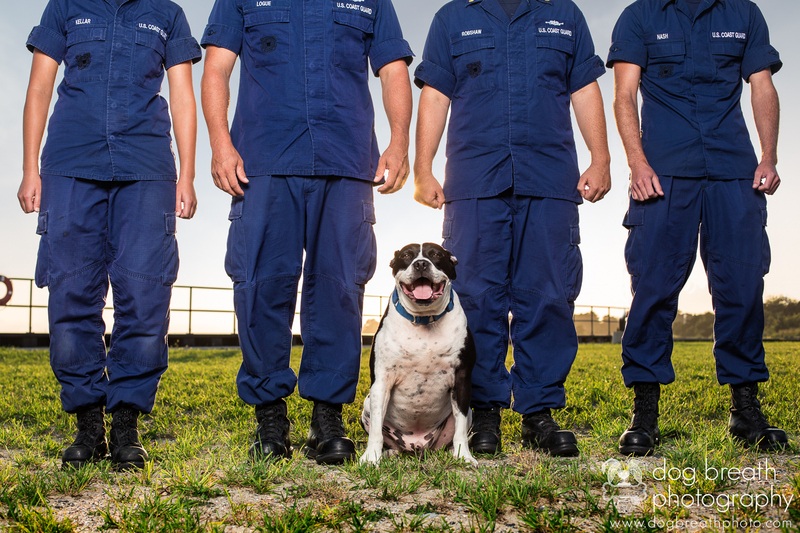 Working dogs come in all shapes and sizes- check out this amazing story about Mr. Beefy’s work with the Coast Guard- a story written by Dog Breath Photography Blog. I absolutely love the passion with which you wrote this story. It made me cry and it filled my heart with so much pride. My husband is active duty Coast Guard, and at one time was the XPO of that beautiful station from Oct 1999 until Dec 2001. I have had the pleasure of meeting SA Beefy on many occasions during visits to IR Station and he is a great representative for the Coast Guard. As a retired Coastie myself, SA Beefy made me think back to Oscar our mascot at Air Station Detroit and although no offense to Oscar (a wiener dog), I would have liked having Beefy as our mascot. Great story and fantastic photo’s. Thank to Georgetown Shelter for saving him, they are real great people. Mr. Beefy’s story picked up by the U.S, Coast Guard page May 7, 2014. Well done Mr. Beefy, Georgetown DE SPCA, and Kaylee of Dog Breath Photography! A wonderful story. Yay for Mr. Beefy!! This story is unbelievably amazing, touching and so sad at the same time. It’s just beautiful how Mr Beefy’s life turned out to be great after all.